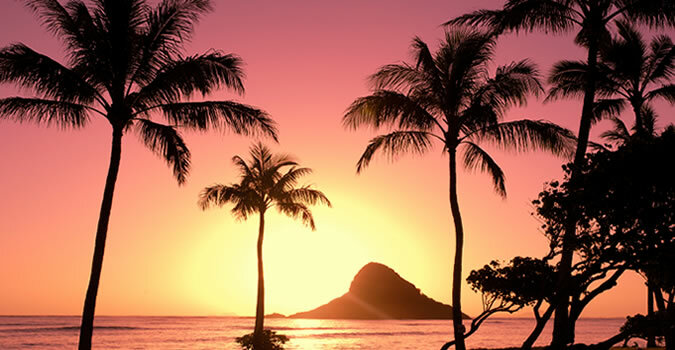 Oahu is dubbed the heart of Hawaii and home to the famous Waikiki beach. This island has so much to offer. Escape to peace and quiet, join the crowd and swim in the warm waters or "deurbanize" and run off to the natural wonders of the island. The Windward Coast is your quiet escape, Waikiki is your surfing dreamland and Honolulu is a party full of dancing and cocktails. Hawaii cruises offer an all-inclusive way to experience Oahu’s island wonders. Cruise to Hawaii and its unrivaled island of Oahu. Sure you’ve heard of Honolulu, but have you experienced it? Have you visited its historic landmarks such as Pearl Harbor, or shopped at its renowned retail outlets or attended its museums and island events or its string of underground bars? And, of course, there’s no place like Waikiki. Whether it's surfing, snorkeling, sun tanning or listening to live music while sipping on cocktails, Waikiki isn’t famous for nothing. Not interested in the tourist gig? Then Windward Coast’s slopping mountains, hidden trails, ocean views and lighthouses might be for you. Are you a foodie? Check out the island’s culinary movement — Hawaii Regional Cuisine. Think fruits and veggies locally grown from volcanic soil, fresh fish and island-raised beef. It’s a culinary collection of ethnic flavors and diversity you won’t want to pass up. HawaiiCruises.travel specializes in discounted Hawaii cruise vacations. We offer highly competitive rates, exceptional customer service that’s equipped with a knowledgeable staff not only familiar with the ins and outs of Hawaiian cruises, but mindful of your budget and your agenda too. Our special Hawaiian cruise packages are available on several of the major cruise lines such as Norwegian Cruise Line, Royal Caribbean, Celebrity Cruises and Carnival Cruise Line. Cruises to Hawaii give you food, island, transportation and convenience. It’s our job to get from land to sea to island, so book your Hawaii cruisetoday on our website at HawaiiCruises.travel or call 1-877-721-8085 for discounted rates plus free onboard credits. Welcome to paradise.